> SEO > Which tools should I buy to advance my SEO strategy? The complexity of an organic search campaign necessitates some technological assistance. There are plenty of tools on the market, but they vary in price, functionality, and effectiveness. Once you have all the basics in place, which SEO tools should you invest in to take your strategy to the next level? The SEO landscape is highly competitive, with every company battling for precious real estate at the top of page one. The points of differentiation between competitors fall into the following, intertwined categories: people and technology. Assuming you already have your SEO team or agency partner in place, you will need to enable them with the best technology on the market. The Google-owned products (Keyword Planner, Search Console, Google Analytics) are essential to cover the basics, but an advanced SEO strategy usually requires some investment in third-party technology. That need has created a crowded market – one that can be difficult to navigate without guidance. Moreover, there is overlap to contend with, as so many tools appear to do so many similar things. In truth, every tool tends to excel in one or two areas. Many will promise to be an all-in-one solution, but the task is too gargantuan to be tackled convincingly. Instead, a combination of tools is required to cover all the bases. At each juncture, we are met by a lengthy list of technology solutions that can reveal new insights, automate the drudgery, and tell us whether our strategy is working. Marketers should prioritize these categories, as budgets are rarely limitless and many of the best SEO tools do require investment. Previously, we have covered the best free SEO tools and the best tools for a mobile SEO strategy. In this article, we will review the best tools to invest in for each of the core areas of an advanced SEO strategy. A Moz Pro licence provides access to an impressive suite of SEO tools. Customers can utilize a site crawl, a keyword tracker, and an on-page grader, among many others. That gives Moz Pro mass appeal, but it is essential to take note of where it excels, and where it is surpassed by other solutions. The Keyword Explorer tool is particularly valuable for research, going far beyond what Google’s Keyword Planner can offer. Moz’s keyword research tool provides a range of suggestions for keywords to target and groups these together by their degree of lexical similarity. At a time when sophisticated SEO professionals have moved beyond keyword matching to a more nuanced targeting approach, this capability is indispensable. Open Site Explorer (OSE) is a long-time member of the standard SEO toolbox and it retains its usefulness for competitor backlink analyses. Proprietary Moz metrics like Domain Authority, Page Authority, and Spam Score add extra depth to OSE and, while it is not comprehensive enough to suffice as the only backlink checker in an SEO’s armoury, it forms a natural complement to the likes of Ahrefs and Majestic. The Moz toolbar also made our list of the best Chrome extensions for SEO, providing access to all the Moz Pro features as you visit websites. Cost: Ranges from $99/month for the basic package to $599/month for the premium offering. Technical SEO is a complex field, characterized (perhaps even caricatured) by never-ending spreadsheets and impenetrable code. The gap between technical SEO experts and business leaders has therefore always been significant. Tools like Screaming Frog, which are highly valuable but difficult to decipher for the novice, have not helped to bridge this gap. And yet, the importance of technical SEO for performance means that its messages need to be communicated to non-technical audiences. Botify manages to dive deep enough to the data to provide meaningful analysis, but also display this in a compelling manner that gets the message across. Core to its effectiveness is the Botify Log Analyzer, which collects and analyzes data at the server level. This provides an accurate record of Googlebot’s visits to the site and highlights any crawling issues. I think you would probably recognize it in the log files. If you look now, probably something like 80% of the crawling is with the Googlebot desktop and maybe 20% is with mobile with the smartphone Googlebot. Another albatross around the neck of technical SEO has been that its improvements are hard to tie to performance. Aside from serious issues that are causing URLs to be left out of Google’s index altogether, for example, many technical recommendations can end up gathering dust while the more glamorous changes are put into effect. Botify Keywords is a handy feature in this sense, as it pulls in Search Console rankings data that can be tied back to any technical changes made on the site. This brings an extra element of accountability to technical SEO, all of which is tracked in the user’s dashboard automatically. Cost: Varies, depending on site. Modern-day keyword tracking is something of a thankless task. With the twin advances of personalization and localization, there is really no such thing as a ‘true’ ranking position for each keyword. Google’s rankings differ based on so many factors that they can no longer be considered a static resource, but we can’t simply ignore rankings. 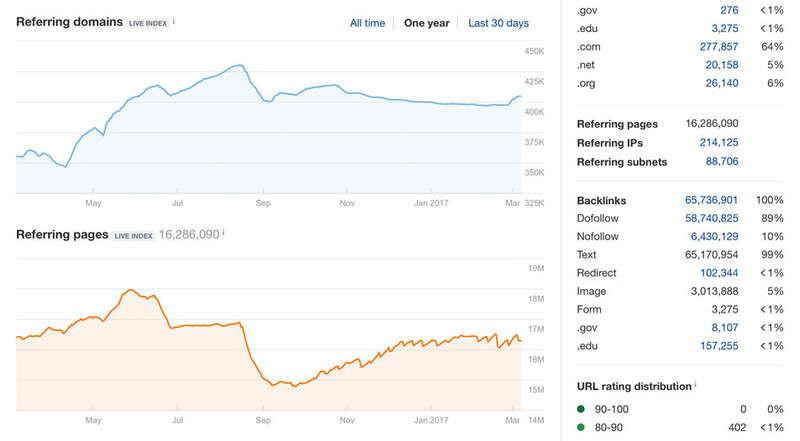 As a result, SEOs will typically use a combination of tools, including Google’s Search Console, to get a handle on how well their site is performing. BrightEdge is the choice of many large corporations for SEO performance tracking, due to its user-friendly interface, customizable reports, and analytics integrations. It also provides the ability to track rankings down to a specific metropolitan area, which proves invaluable for brands with a presence across a range of territories. Though the platform has evolved to encompass these new products, at its core BrightEdge is still a reliable rank tracker that provides at-a-glance performance insights for stakeholders from the SEO specialist to the CMO. Cost: Dependent on number of keywords, domains, and territories required. Honorable mentions: STAT Search Analytics, SearchMetrics, SEMrush. When assessing a backlink analysis tool, there are some essential fields to consider. Firstly, the size of the technology’s index of URLs should be assessed to discern how accurate its findings will be. None will exactly match the scope of Google’s index, which of course is significantly larger than any SEO tool could muster. However, it is important to bear in mind that each tool crawls and creates its own index, so the results you see in your dashboard on each may be different. Next, check to see how frequently the index is updated. Given the importance of links for SEO rankings, most practitioners will want to see the quantity and quality of backlinks directed to their site on at least a weekly basis. Ahrefs’ index contains 3 trillion URLs and is updated daily, which gives it the edge over its competitors. It provides a comprehensive overview of historical backlink performance and helps SEOs to pinpoint any issues that may be hampering performance. Ahrefs is also a great resource for competitor analysis and can be used to find new websites to target through outreach activities. All in all, Ahrefs provides the best package for advanced backlink analysis. Cost: From $99/month to $999/month. Backlinks are a vital factor in how Google crawls the web and ranks websites, but social shares and mentions are the next stage of evolution for a content marketing strategy. Essentially, a site with content that attracts a lot of relevant, authoritative links and large quantities of social media interactions may be looked upon favorably when it comes to ranking websites for a specific query. That is easier said than done, of course. 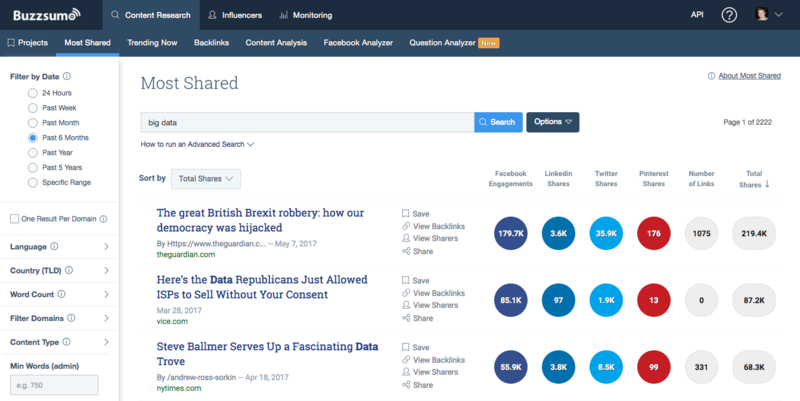 Buzzsumo has become an important tool for SEOs precisely because it aids us in this difficult task. Marketers can enter a domain name or just a keyword to see which pieces of content are performing best in terms of backlinks and social media shares. The intuitive interface allows for a lot of customization, so it is possible to hone in on particular social networks, dates, or topics. This makes it a helpful resource for influencer research too, as it also identifies the individuals that have helped certain content assets to ‘go viral’. Buzzsumo can’t write the content for you, but it does a great job of at least telling you what to write about. It also provides almost instantaneous feedback on how your content is performing, making it an infinitely valuable tool for an advanced SEO strategy.